Ericka Nicole Event Planning & Lifestyle Management will be hosting their annual fundraising event, The Hat & Heels Brunch, and selected Close the Gap as the beneficiary of the proceeds to further our cause. 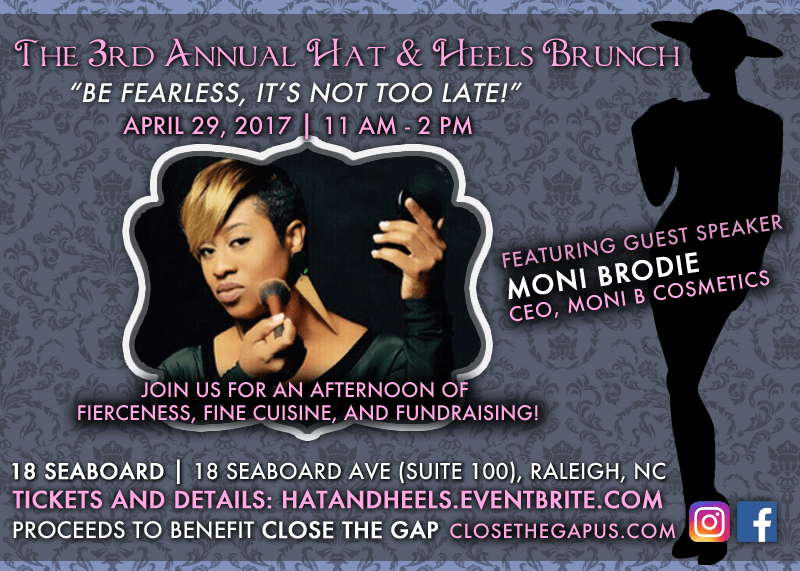 The brunch will be held at 18 Seaboard (downtown Raleigh, NC) on April 29, 2017 from 11am until 2pm. Join us for a spirited afternoon, of fierceness, fine cuisine and fundraising! Guest speaker, Moni Brodie, CEO of Moni B. Cosmetics, will encourage YOU to be fearless in pursuing your dreams no matter where you are in life by sharing her inspiring story of how she created a successful cosmetics company. In addition to her cosmetics line that is quickly becoming a household name, Moni was recently recognized by Impact Magazine as one of its “50 Most Influential Women” standing among the ranks of Egypt Sherrod (HGTV), Toya Wright (Entrepreneur) and Marlo Hampton (Style Strategist, Real Housewives of Atlanta), to name a few. Moni B. Cosmetics has been featured at the BET Hip Hop Awards and worn by celebrities including singer & reality TV star, Towanda Braxton, singer, Jasmine Sullivan, and actress, Erika Alexander. In the Fall of 2017 Moni Brodie will expand her stake in the beauty industry by opening The Glam Boutique by Moni B., which will provide a full range of beauty services to VIPs, celebrities, and everyday women wanting their own personal mobile beauty team. Please join us for an empowering event and a brunch with purpose! Early bird tickets will be available until March 16th, so click here to get your tickets today!! !